I think I'm obsessed. In one week's time I purchased four (unneeded) nail colors- I have over fifty little bottles of nail polish, and am pretty sure I didn't need any more. But I just had to have a mint color, and then a wonder woman blue, and then an ocean blue, and then the first mint wasn't minty enough, so out I went and purchased a better mint! Why?! Either way my nails are definitely an extension of my wardrobe, and they need to be dressed up too. ﻿There like mini cheaper outfits- for my nails. Blue and I are definitely having a moment right now. Haha! 50 bottles of nail polish!! I barely have more than 10! Don't get me wrong, I loveee nail polish, but I always end up wearing the same shades. Love the one your wearing though. Teal might be next on my list! i agree, girl... i went to target last week and got about 4 nail polishes. TOTAL waste of money because i already have enough mint colors... just can't enough of them. lol! I'm so into blues right now too! 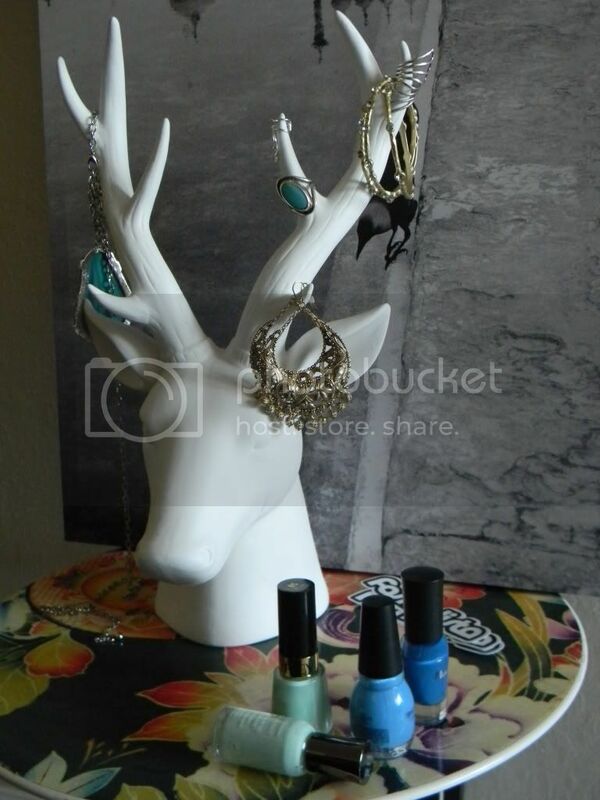 And your jewelry stand is crazy - love, love, love it! you sound like me, i was looking for the perfect blue so i have like 6 shades as well! I knew i was normal. wow, gorgeous. blue is so refreshing! also, i just found your blog...consider yourself followed. awesome blog!! im so into blue right now, actually going to do my nails in blue right now! Hahaha 50? Nothing wrong with having that much nail polish! At least you have a variety whenever you feel the need to change it.. I have the same sally hansen mint color and I really love it! Love that ring on your pinky and your diy kimono! So cute! There is so nothing wrong with having that many bottle of polish! I've shoved mine in a box and put it the fridge now it's hot. Love the kimono, it's so pretty! Gotta ask, i've been looking for something like your white porcelain deer head to hang my jewellery - may i ask where you purchased it? Or where i might find something similar? @pancakeStacker: do it, it's such a fun color, plus hello $2.80 polish from F21!! @Cindy Ngo: cheaper than here- I don't believe it! The deer head was purchased at Kohls believe it or not- it was part of the Elle Home collection. And I just fell in love, had to have it! My bf still hates it, to this day! @MalibuMara: you and me both girl! @LaynahRose: thanks doll- can't wait to check out your blog! @FASHION ICE: we are blue nail sistas right now-I have the teal on! @Angel Garcia: you know it- a girls gotta have choices! @Meagan: isn't it the best?! @BRIT GREEK: haha great idea bought the polish! I bought the deer head at a department store in California called Kohls. It was purchased last year in December, not sure it's there anymore, but check out the site here: kohls.com. good luck! @Marinna: you need to stock up, it a hot color right now! These light blue nail colors are my favorite for summer. I also love your kimono. That nail color is perfect! Love it so much! Love all the blues!! The color on your nails is so PRETTY! hahahaha LOVE that! and i love your outfit, too... you look amazing!